, attorney-general in the reign of Charles I. the son of William Noy, of St. Burian, in Cornwall, gent, was born in 1577. In 1593 he was entered of Exeter-college, where he continued three years in close application to his studies. 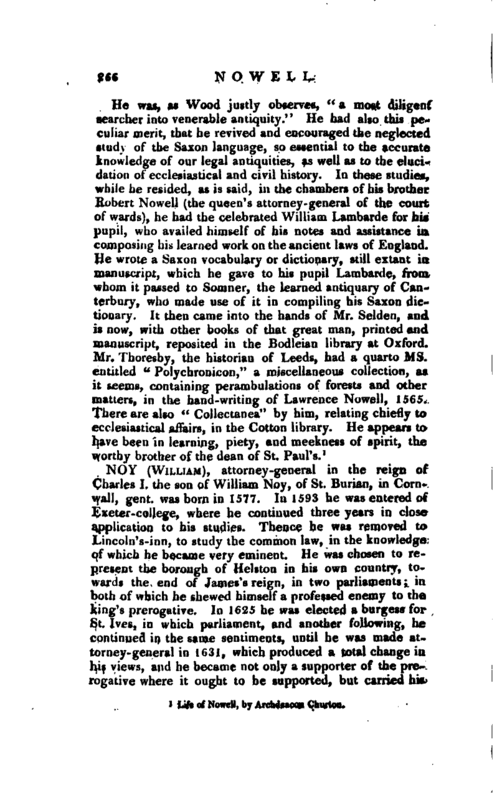 Thence he was removed to Lincoln’s- inn, to study the common law, in the knowledge of which he became very eminent. He was chosen to represent the borough of Helston in his own country, to* wards the end of James’s reign, in two parliaments; in both of which he shewed himself a professed enemy to the king’s prerogative. In 1625 he was elected a burgess for St. Ives, in which parliament, and another following, he continued in the same sentiments, until he was made attorney-general in 1631, which produced a total change in his views, and he became not only a supporter of the prerogative where it ought to be supported, but carried his | notions of this power so far as to advise the measure of ship-money, a tax levied without consent of parliament. 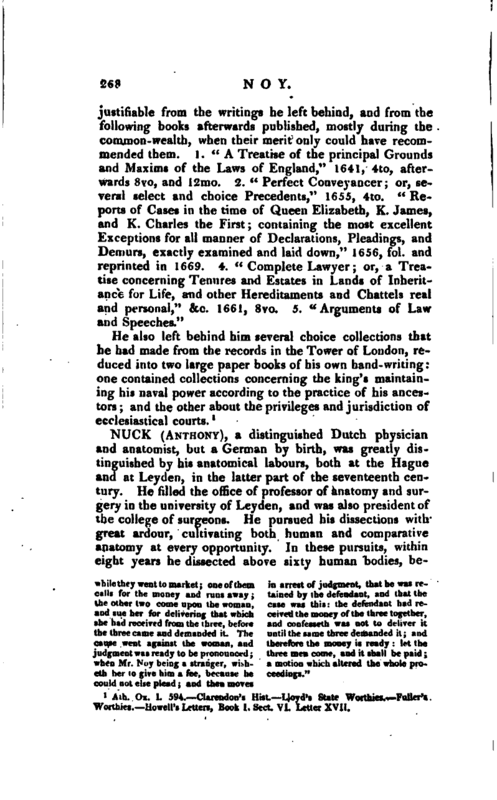 He was unquestionably a man of great abilities, but flattered so much upon that account, that Clarendon says he thought “he could not give a clearer testimony that his knowledge in the law was greater than all other men’s, than by making that law, which all other men believed not to” be so. So he moulded, framed, and pursued the odious and crying project of soap; and with his own hand drew and prepared the writ for ship-money; both which will be the lasting monuments of his fame. In a word,“adds this excellent historian,” he was an unanswerable instance, how necessary a good education and knowledge of men is to make a wise man, at least a man fit for business.“Noy, however, did not live to see the full effect of his measures. In 1634 his health was much impaired by the fatigue arising from his professional duties, and he retired to Tunbridge Wells, where he died in August, and was buried at New Brentford. 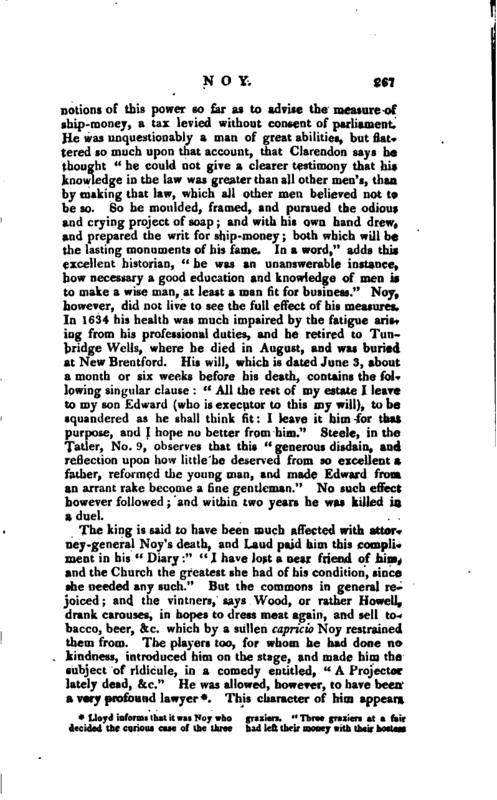 His will, which is dated June 3, about a month or six weeks before his death, contains the following singular clause:” All the rest of my estate I leave to my son Edward (who is executor to this my will), to be squandered as he shall think fit I leave it him for that purpose, and I hope no better from him.“Steele, in the Tatler, No. 9, observes that this” generous disdain, and reflection upon how little he deserved from so excellent a father, reformed the young man, and made Edward from an arrant rake become a fine gentleman." No such effect however followed; and within two years he was killed in a duel. while they went to market; one of them calls for the money and runs away; the other two come upon the woman, and sue her for delivering that which she had received from the three, before the three came and demanded it. The cause went against the woman, and judgment was ready to be pronounced; when Mr. Noy being a stranger, wisheth her to give him a fee, because he could not else plead and then moves in arrest of judgment, that he was retained by the defendant, and that the case was this: the defendant had received the money of the three together, and confesseth was not to deliver it until the same three demanded it; and therefore the money is ready: let the three men come, and it shall be paid; a motion which altered the whole proceedings." Ath. Ox. I. 594.—Clarendon’s Hist.—Lloyd’s State Worthies.—Fuller’s Worthies.—Howell’s Letters, Book I. Sect. VI. Letter XVII.